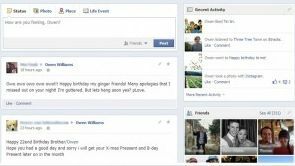 Facebook has begun rolling out a new Timeline layout which groups all your friends' public communiques on one side of the wall while other bits and pieces are locked to the other. This makes the whole thing look a bit less 'timeline-y' but does mean a cleaner, easier to read layout without any danger of you missing anything on your own wall. Sorry, timeline. Thing. Whatever. Wait a minute, you're thinking. This isn't a CES 2013 story! And you're right - we're as surprised to be writing it as you are to be reading it.